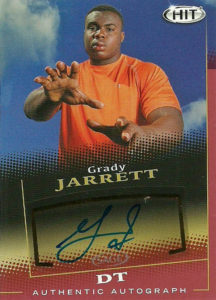 Grady Jarrett played for the Clemson Tigers from 2011-2014. The Tigers have really poised themselves as a pipeline for future defensive line NFL talent over the last 5-10 years. Grady was no exception. Over his college career playing at defensive tackle, Grady finished with 144 total tackles, 28.5 tackles for loss, and 5.5 sacks. Considered undersized, the Atlanta Falcons selected Grady in the 5th round of the 2015 NFL draft. He was considered a ‘value pick’. Grady started 2 games his rookie season and posted a sack, 13 tackles, and 11 assists playing primarily nose tackle. In 2016, he was shifted to defensive tackle. In 14 starts Grady put up 21 tackles, 27 assists, and 3 sacks. It’d be during Superbowl LI that Grady shined. On the big stage he tied a Super Bowl record, sacking quarterback Tom Brady 3 times. If not for the Patriots furious comeback, Jarrett could’ve been the big game’s MVP. He’d return for a full slate of games and record 34 tackles, 21 assists, and 4 sacks in 2017.